Mike gave me an Amazon Kindle for Christmas (the 6 inch screen version). Can I tell you how AWESOME this thing is?! First of all, it looks just like a book. Well, while you’re reading, the text on the pages looks the same. If you get a cover for it (which I HIGHLY recommend), it feels like a book because you can open it. 🙂 And if you get a clip-on light so you can read in bed while your significant other is sleeping, the cover is the perfect place for you to clip it to (and yes, I did get the purple light, thank you 😉 ). The cover also helps protect my Kindle when I throw it in my purse…which is where it lives when I’m not reading or charging it. And it’s so light! I was afraid that I wouldn’t be able to “curl up” with it, but I really can. I can hold it with one hand – either hand as well since there is Next Page button on both sides of it. There’s no glare and it’s easy on the eyes. I also received a few gift cards for Christmas that I thought would be perfect for purchasing books. Ya…it was a slight nightmare. 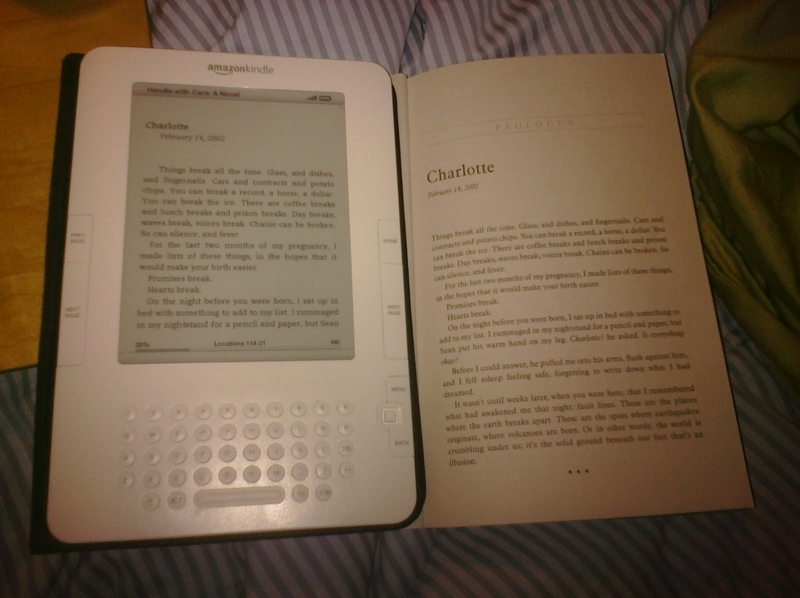 Luckily, it’s super easy to ‘return’ books through the Kindle if you’ve accidentally purchased them! LOL! I mistakenly thought I’d be able to enter the gift card number after purchasing the book through the Kindle (as opposed to through the Amazon website)…nope. So then I tried purchasing a book through the Amazon website figuring I’d enter the gift card number at checkout like you would for a ‘regular’ purchase. Ya…nope. Turns out that you have to enter the gift card number into the redemption page before purchasing anything on the Kindle and it will automatically use the gift card money. So…it worked out, it was just a bit of a learning curve (with some frustrations) on my part. A built in dictionary. If I don’t recognize a word, I can click down to it and it automatically pops up a definition!! It goes right to where you left off in the book…no fumbling around for where you were. You can create manual bookmarks if there are spots you know you’d like to return to. One of the things I’ve really been enjoying is the free sample. You can download a free sample (usually a chapter or two) of any book available for Kindle and then decide if you want to purchase it…a simple click from the Kindle, of course! But the reason I’ve enjoyed it so much is that if someone recommends a book, you can immediately download the sample and not forget about it! There have been millions of times that someone has recommended a book and I’ll think “okay – next time I’m at the book store and I have nothing to read…I’ll pick that up.” And then when I get there, I’ve totally forgotten what that book was. I don’t have that problem any more!! And I don’t have to worry about spending a whole bunch of cash if I don’t have any at that exact point in time. Another cool thing I discovered..? FREE BOOKS!! (Okay, I didn’t discover them, my friend at Lit & Laundry pointed the way…) Some of them are like, $1, but there are a whole bunch that are free. And not just ones that your next-door-neighbor probably wrote (although, watch out for those 😉 ) You can search for the free ones on Amazon as well, but the link above points you in the right direction. only science fiction and fantasy; some are free; make sure you choose the “Mobil/Palm/Kindle Format” option to download. Anything else I should know about my Kindle? Anything else you’d like to know? Great review! It sounds really awesome! I was wondering how does it download? Do you have a cord or is it wireless internet capable?